Patrick Desmond Carl Alexander Guinness, KLJ (born 1 August 1956 in Dublin) is an Irish historian and author, and one of heirs of the Guinness business dynasty. Son of Desmond Guinness and Marie-Gabrielle von Urach, he was educated at Winchester College and Trinity College Dublin. He continues his father's business in real estate development and is a financial analyst. He formerly represented Sothebys in Ireland. 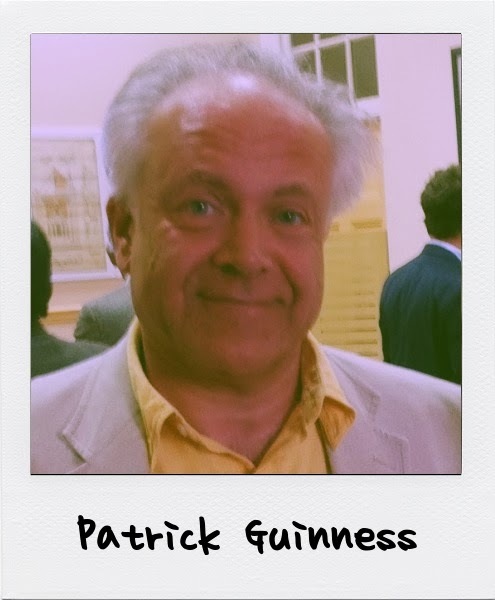 A historian, Patrick Guinness has authored a biography of Arthur Guinness, the founder of the Guinness brewery dynasty. He has lectured on genetic genealogy relating to the early Irish dynasties and Viking Ireland, and has sponsored academic research on Irish genetics. He is a council member of the County Kildare Archaeological Society and of the Order of Clans of Ireland. He is a trustee of the Iveagh Trust and President of the Irish Georgian Society. His daughter by his first marriage is the celebrity model Jasmine Guinness. He remarried in 1990 to Louise Arundel and they have 4 children. Through his mother's descent from the second Duke of Urach, he is a potential claimant to the medieval Kingdom of Jerusalem, Kingdom of Lithuania and to the Principality of Monaco (see Monaco Succession Crisis of 1918). He is also 2259th in line of succession to the British throne. This Wikipedia page was last modified on 12 August 2013 at 23:36. A great panel, if I may say so. I have met Elizabeth, Finbar, and Margaret at least once, and Patrick several times. In fact it was a lecture by Patrick in Sligo (2004) that got me interested in DNA. I am very sorry to miss this get-together, and wish it all kinds of success, but I returned home to Florida 15 October after attending a Clan O'Byrne of Leinster meeting. Incidentally, we have collected over 45 additional Leinster Byrne DNA samples during the past several months and at the meeting that, with the 55 previously tested, will bring us to 100 for that lineage. I hope that sampling at your endeavor will add to other Leinster surname projects since many of them apparently have common genetic backgrounds with ours.